Colonialism is the policy whereby a nation seeks to gain authority over other peoples or territories. The subjugated people are generally exploited for the economic benefit of the colonizing country. 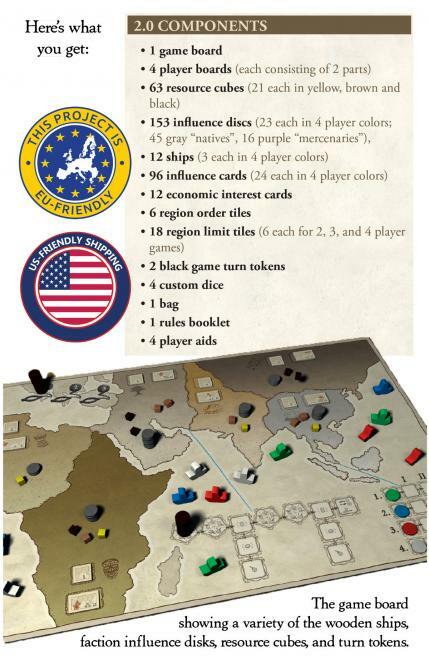 Colonialism is played in game turns. The heart of the game turns are the Action Rounds. In each Action Round a player either draws 3 cards, moves a ship, withdraws influence discs, explores a region or plays an influence card from his hand. 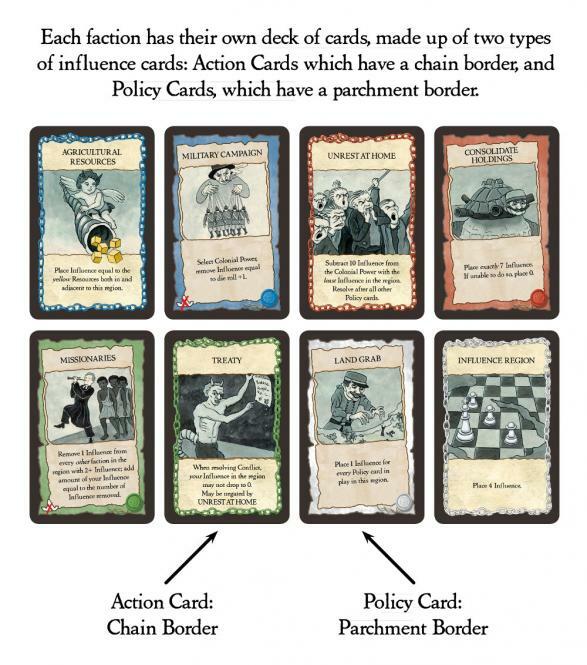 Influence cards are either Action or Policy cards. Action cards are played and immediately resolved in an affected region on the board. 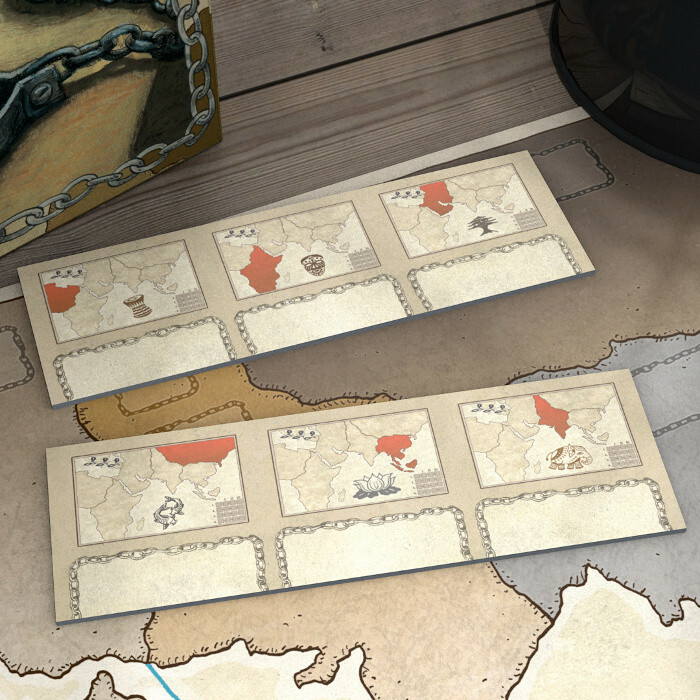 Policy cards are placed in the player´s colonial policy area and are not resolved until the end of the next colonization phase. As these cards are normally placed face down, there is a fair amount of bluffing and suspense. There is hardly any downtime in Colonialism. Individual player turns are short and swift. The game is very elegant without a lot of “rules overhead”. It also scales well – any player numbers from 2 to 4 are fine. 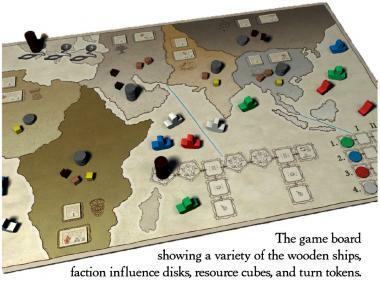 Thanks to the art of the always amazing Harald Lieske Colonialism is a “serious” look into this chapter of recent history in game form. So what is new in this edition? 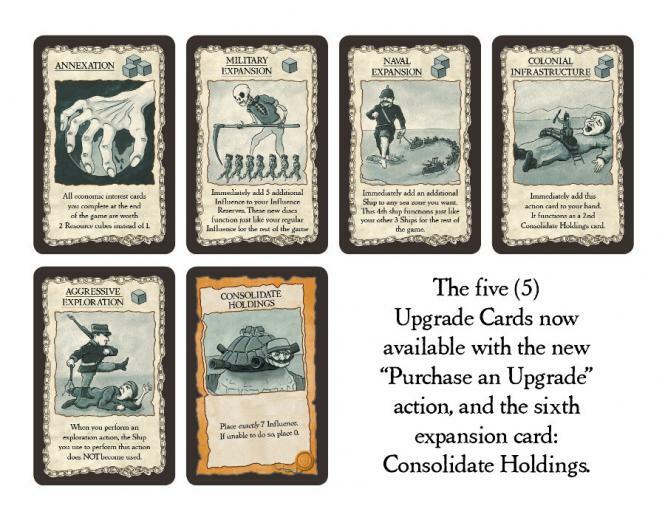 The main items in this new edition are the 6 new cards, five of them being Upgrade cards. 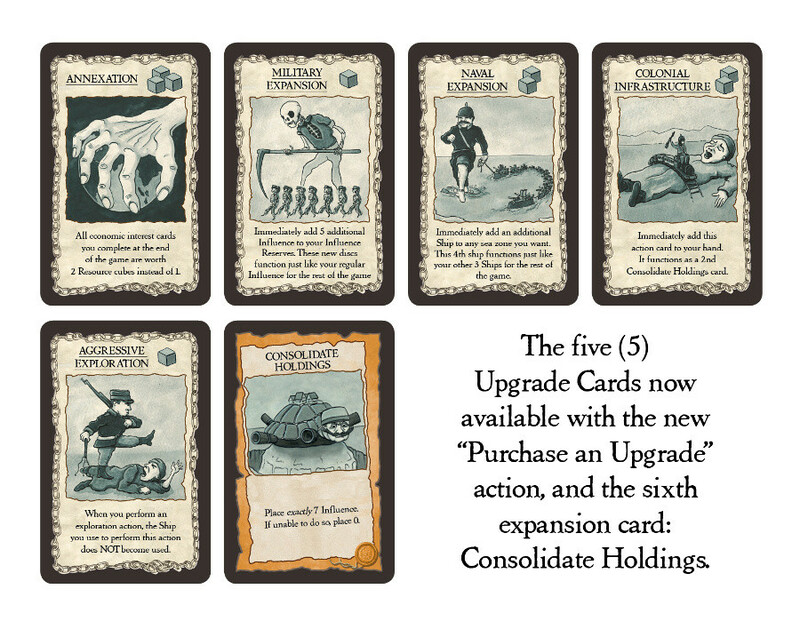 This edition therefore adds a new action to the game: Purchase an Upgrade card. Colonialism is a game of 19th and early 20th century imperialism. Each of the 2 to 4 players assumes the role of a nondescript colonial power. 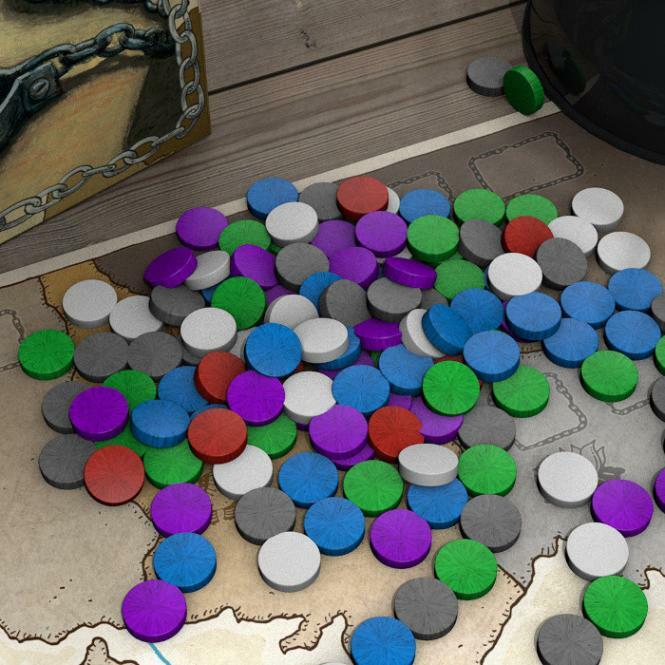 Players will try to gain influence in the unindustrialized regions of the game board and to obtain as many resources as possible. Although the colonial powers are anonymous in the game, Colonialism aims to be a serious, though abstract, look at this dark chapter in recent world history. In the game, each player has their own deck of 24 influence cards. The decks of all players are identical. 7 of the 24 cards are action cards that are played and immediately resolved. The other 17 cards are policy cards that are played face down to one of the six regions of the game board. 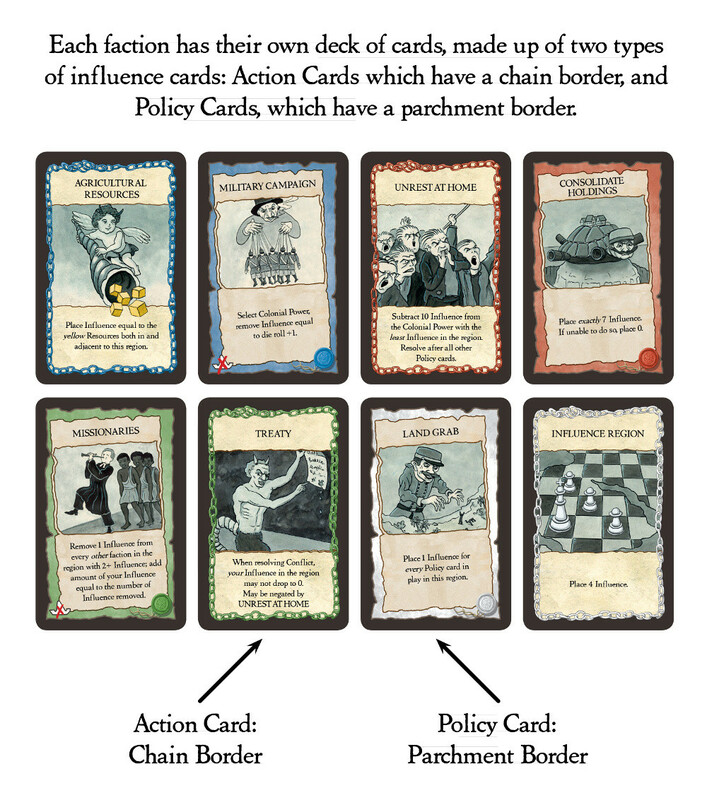 All policy cards are only resolved in the colonialism phase of a game turn. These cards increase or decrease a player's influence. This innovative mechanic is exciting, suspenseful and reduces downtime. Throughout history, colonizing powers would often justify their actions under the guise of improving the colonized people’s health, economic, religious, or social wellbeing. Euphemistically, this systemic process of exploitation was referred to as “modernizing.” Modern colonialism began in the 15th century. By the outbreak of World War I, Spain, Portugal, Britain, France, the Netherlands, Germany and other European countries had gained control of 84% of the globe. Typically, the European Powers followed a policy of mercantilism, to strengthen the home economy at the expense of rivals. The colonies were allowed to trade only with the mother country. Raw materials would flow freely from the colonized areas to the homeland, while the colonizing power could take advantage of their total monopoly and use their colonies as an export market for their overpriced good and wares. 1 box and lid set.